There is nothing cuter that a dog that loves his toys. Whether it’s a stuffed toy they shred into pieces or a squeaky toy, watching their endless joy as they play is a complete satisfaction. Pit bulls are a big bundle of joy, but they also love destroying their toys when they play. If you own a pit bull, you know how true this is and how fast you keep going to the pet store to get new toys for them. They have powerful jaws that call for strong toys. They, therefore, require toys that are made from strong material. Here are the reviews of the top 10 chew toys for pit bulls. Pit bulls absolutely love their toys. More accurately, they love destroying their toys. They are enthusiastic chewers and new squeaky toy can quickly turn into a pile of barely recognizable pieces within a few minutes. Chew toys provide pit bulls with a great deal of entertainment and an easy way to let go of the steam. Pit bull toys are generally classified into three types i.e. These are toys that keep them busy. Nyla-bone, ropes, ropes and KONG toys fall under this category because they are easily thrown, tossed and chased. Pit bulls have a tendency to eat their toys so anything that’s damaged should be done away to avoid a choking hazard. These are toys that dogs love to carry around in their mouth. Some come with squeaky sounds that inspire dogs to mangle the toys to get rid of the noise by any means necessary. They distract dogs by captivating their senses. They are often the kind that can be filled with treats that can be removed with manual manipulation. The active chew, chase or tumble rewards them with bits that will keep the busy for a while. These rope tugs are extremely strong durable, making them a great option for dogs. Even the most aggressive chewers can handle the knots. In addition, the heavy rope doesn’t wear down even when subjected to games of tug of war. Probably the best thing about the Mammoth Flossy Chews Cotton Blend Color Rope Tug is that it is available in several sizes, including ones suitable for pit bulls. They come with plenty of knots tied in for your dog to chew and are very tough to destroy anyhow. Rope toys help improve your pit bull’s dental health by acting as floss. In addition, they help keep your dog occupied for hours on end. The main downside that is that the cotton blend material it’s made from isn’t as strong as nylon or rubber and as such, sheds more easily. In addition, rope toys aren’t easy to clean up after your pup has torn it to pieces. It is no secret that KONG is a brand that makes high-quality dog toys. In fact, their products are so tough that they are often used in K9 training. If that tells us anything, it’s that anything that’s tough enough to withstand police dog training is good enough to survive your pit bull at home. This particular KONG toy is about the size of a tennis ball is durable as well as bouncy. These properties make it the perfect chew toy for games of fetch with a pit bull. 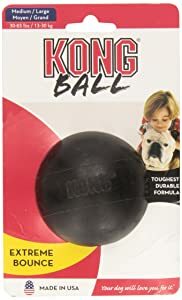 Its weight makes it impossible for the KONG Extreme Ball to float, which is more than can be said for many rubber balls. It comes with a small hole running the center that you can fill with tasty treats. This not only provides a fun feature for your pup, but it also provides a surface for his teeth to grip at. Another advantage of this ball is that it is extremely smooth. 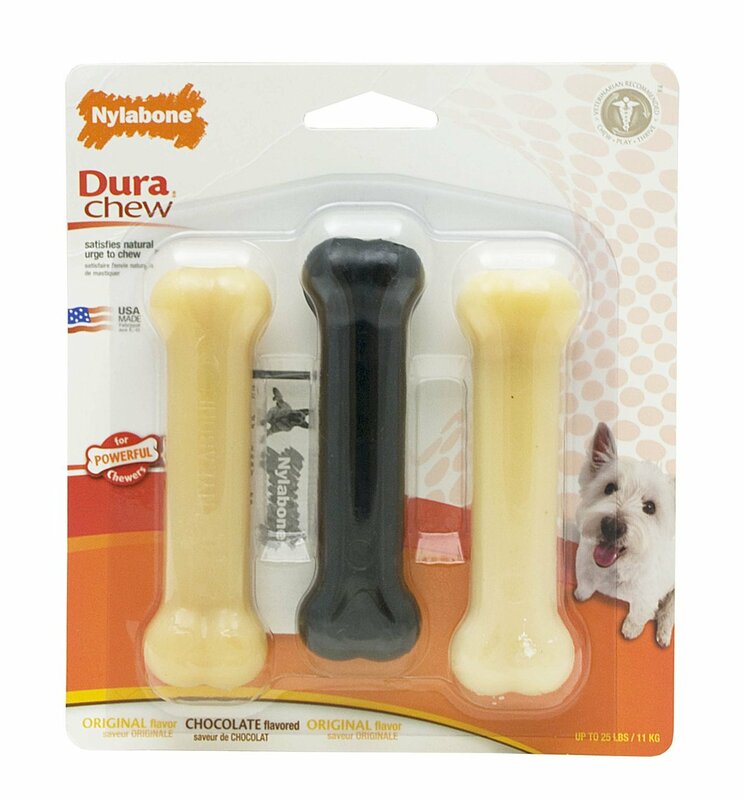 The Nylabone Dura Chew Bone is a simple bone-shaped toy that is made from nylon, a material known for its strength and durability. Unlike rubber toys, it is extremely tough and doesn’t easily yield to the teeth of an aggressive chewer. The ridges and grooves built into this chew toy not only provide dental stimulation, but they also provide texture. It comes with a rough surface that easily grinds plaque from the surface of the teeth, thus ensuring that gums stay healthy. 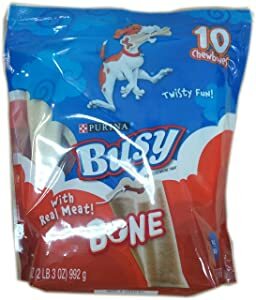 The fact that the chew bone is available in various flavors makes it more enticing. It also comes in several sizes. Just as it is with rubber toys, a bigger chew bone is better for your pit bull. The main concern is that one should keep a close eye on their dog when playing with it splinters can easily get lodged in their digestive tract. You should replace it immediately if you notice that it’s falling apart. This is a hollow chew toy that can be filled with your pup’s favorite treats. This provides a rewarding and fun challenge that keeps him occupied for hours. It is made from rubber. 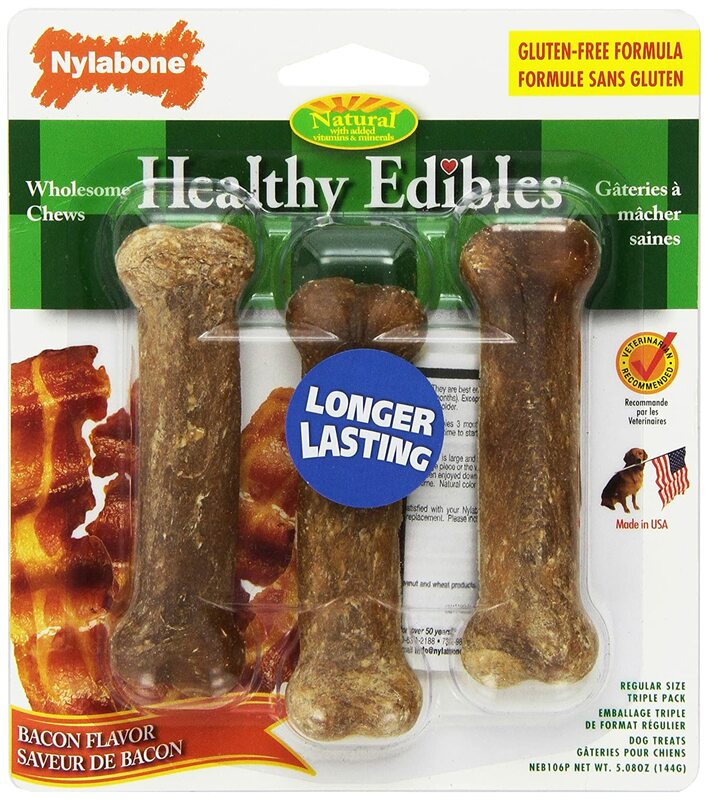 It gives your dog a blast as he tries to dig out bits of frozen peanut butter, bacon or other tasty treats. It has a three-ponged shape that not only makes it interesting, but also a fun chew toy. The shape also allows your dog to grip and chew on the toy or carry it around easily to show off to visitors. The toy is made from a mixture of rubber, latex as well as non-toxic phalate. It can withstand aggressive pit bull chewers but unfortunately, the toy isn’t as tough as other rubber toys in the market. Keep an eye on your pup in case he chews off one of the pongs as this can lead to a choking hazard. While this simple ring toy may not look like much, it is one of the toughest chew toys for pit bulls. 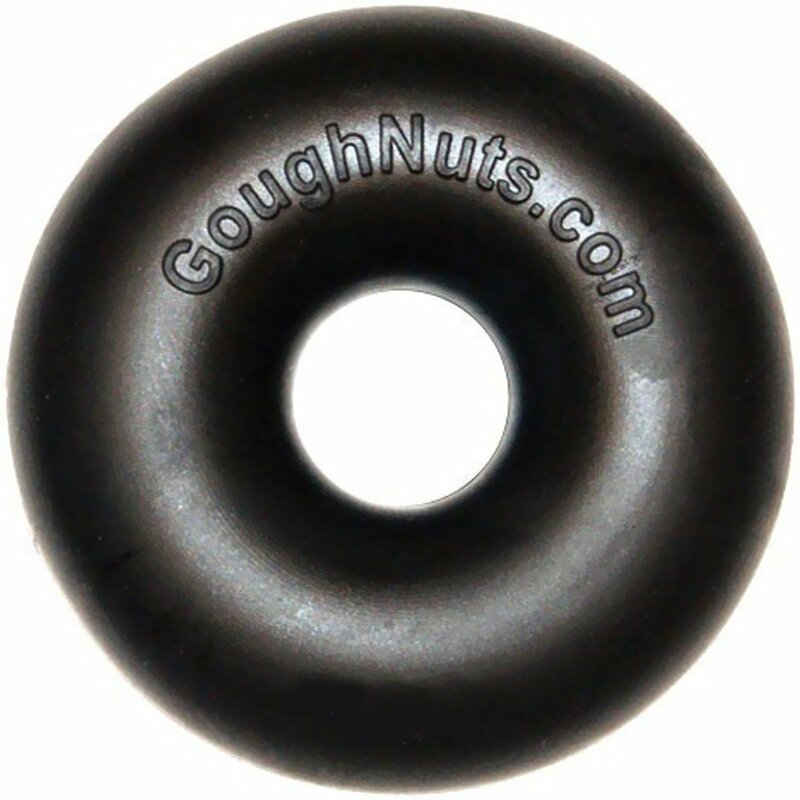 Goughnuts is a line of chew toys that are specially designed for aggressive chewers. The toys are designed by polymer and mechanical engineers to be indestructible, making them a great option for pit bulls. The Goughnut Black Maxx Rubber Dog Ring is the perfect shape for picking up, chewing on and carrying around. It also floats in water, which is great especially if your dog likes to take a dip in the swimming during playtime. The entire Goughnuts product range comes with an interesting built-in safety in feature. The center of the ring is made from red rubber and surrounded by a thick layer of black rubber. Exposure of the red rubber makes it possible for you to know when the toy should be replaced. This is a high quality product from Purina that comes in large, regular, small and miniature sizes. It is a tube that’s heart shaped and which comes with real meat in the center. It is available in various flavors including cheese and chicken. The flavor of from the meat seeps into the long lasting, thus creating a delicious taste that keeps your pup busy. The regular and large sizes work great for pit bulls. This toy is at number six because it takes 15-20 minutes to eat and as such, isn’t long lasting. Some reviews also cited that it made their dogs sick. Nevertheless, pit bulls generally love it for its taste. 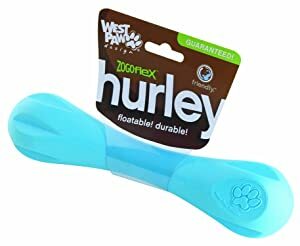 It provides plenty of dental exercise and is a great option if you are looking for something that works both as a chew toy and food dispenser. 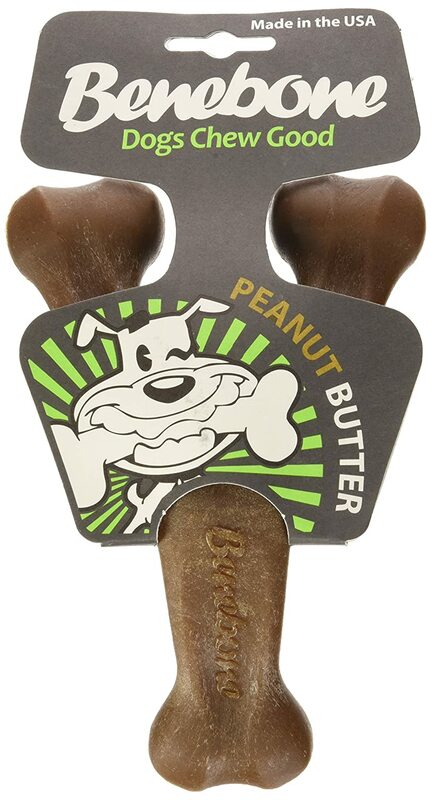 This is another bone chew toy that your pit bull is bound to love. It is made from extremely strong nylon and is available in three different flavors i.e. chicken, peanuts and bacons. 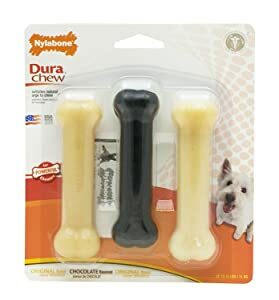 If you are crazy about feeding your dog only natural foods, you’ll be glad to know that no artificial flavors or chemicals are used in the manufacture of the Benebone Nylon Wishbone Chew toy. It comes in three sizes and the Jumbo one is perfect for an aggressive Pit bull. This chew toy is designed to offer hours of fun but not to be eaten. We recommend monitoring your dog to ensure that he doesn’t consume it. It’s also important that you replace it once signs of wear start to show. Given that it’s made in an environment with nuts, this toy isn’t the best if your pit bull is allergic to nuts. This is made by the same company as #3 and is ideal for all adult dogs, including pit bulls. It contains natural ingredients and is flavored with filet mignon. Additionally, one half of it has raised nubs that rotate 360 degrees. This makes for effective teeth cleansing action. This helps clean your dog’s teeth as well as freshen their breath. The nutrients are easy to digest and the bone doesn’t contain any fake ingredients or preservatives. 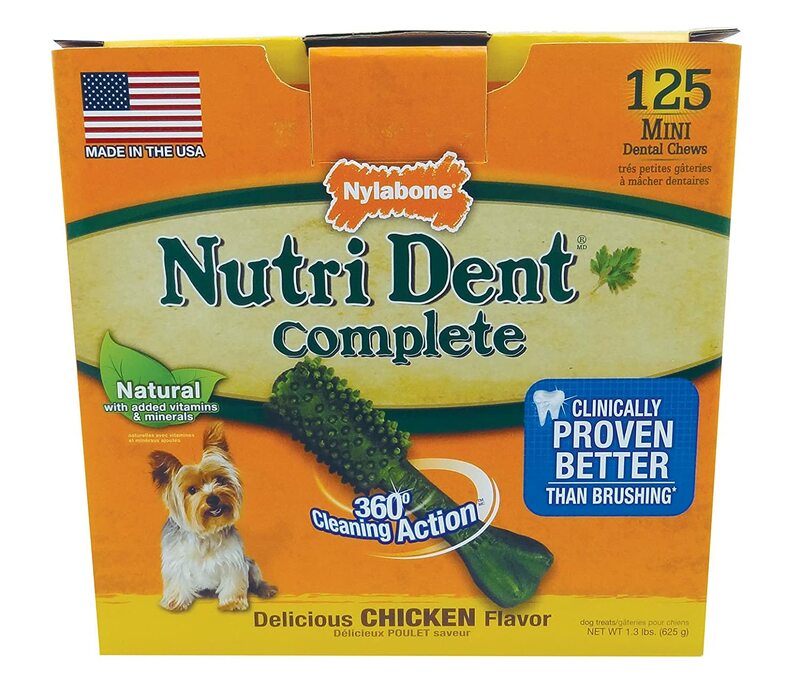 Like most products on this list, the Nylabone Nutri Dent Dog Treat Dental Bone is manufactured in the United States. 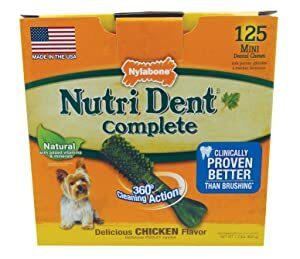 For many consumers on Amazon, the product is hard and durable enough to keep a dog’s teeth in fighting shape while removing plaque and promoting their oral health. As it contains no corn or wheat, it is a perfect option for pups with sensitive stomachs. It also doesn’t cause allergies. This is a gluten free chew bone that comes in a variety of flavors that your dog will appreciate. It has no artificial preservatives, salt or fake colors and added sugars. The treats are digestible and organic. They are also a great option for pit bulls that already have a healthy digestive system. You can choose from seven flavors including chicken, turkey and sweet potato, beef stew, filet mignon, bacon as well as lamb and apple. You can also get a variety pack for your pitbull if you prefer, which is available in four sizes i.e. super, giant, wolf and petite. The bone is made with a long-lasting formula, meaning your dog will be chewing on it for years before you start worrying about a replacement. 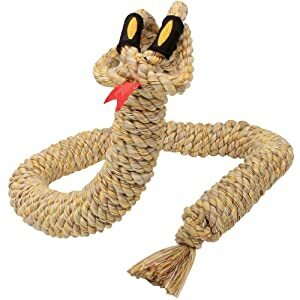 This is another classic rope toy from Mammoth that makes for a great chew toy for your pit bull. Its 26 inch to 42 inch length gives your pup plenty of room for tugging games. It is also available in small, medium and larger sizes, with the larger size being the ideal option for your aggressive dog. The larger size is also fun [if you are looking for something that’s more fun than average toys. The rope is made from tough and durable fibers that can withstand the most aggressive dogs. The main advantage of the Mammoth 26-42 Inch Snakebiter Rope Tug is that like most ropes, it does a good job of flossing your dog’s teeth. As parents to fur babies, many of us like pampering their dogs with things that keep them occupied and from chewing on our shoes. Getting the right toy is a smart move that a pit bull can make. There are several factors that affect the right choice of chew toys with the major ones being breed characteristics as well as the energy of an individual dog. Age and size are also important. The density of the material of the toy should be considered because soft toys break easily and this makes them a choke hazard. This is the first consideration that you should make when purchasing chew toys for a pitbull. You want to make sure that you invest in something that your dog won’t destroy within a few minutes. As such, soft and plush toys aren’t an option. In addition, toys that claim to be indestructible but have seams shouldn’t be an option because a determined pitbull will just tear it apart. These dogs can’t destroy solid rubber toys easily. KONG toys are often made of this material and what’s better is that you can fill them with treats to keep your dog occupied for hours. Rope is also a popular material used to make dog toys. However, it’s safety questionable. This is to say that dogs can pull the fibers depending on how determined they are. If that happens, it can lead to digestive problems when fibers ball up in the intestinal tract. Supervision is required to prevent such issues from arising. On the other hand, rope toys go a long way towards helping improve the dental health of your dog. If your pit bull can chew up a toy easily, it’s possible that she’ll end up consuming chunks that are too large and which can lead to choking hazard or worse, an intestinal blockage. Getting a safe chew toy for your pit bull is of uttermost importance. On the other hand, choosing too small a chew toy can be equally dangerous. The ideal chew toy should be large enough that your dog can’t swallow it. A pit bull should never be given a tiny bouncy rubber ball the same way you’d never give your baby a marble to play with. It’s also important to understand that even a large toy can still injure a dog. You should watch out for any sharp or jagged edges as they can cut into your pup’s lip or gum, leading to infections. Soft and fluid edges are the best when it comes to chew toys. Sticks, rings and balls with such edges make great choices. You should also make sure that whatever toy you get for your dog doesn’t have a risk of splintering easily. This is particularly important if the chewable toy is edible. Cooked bones are susceptible to splintering and as such, can easily end up lodged in the intestines, stomach or windpipe. Always make sure that your dog plays with safe toys that don’t splinter easily. Chewing is very important for dogs as it helps promote their dental and mental health. It keeps their mind occupied, body exercised and teeth clean. Investing in a chew toy for your pitbull is also important as it helps prevent behavior problems such as chewing on inappropriate objects. This guide has outlined our thoughts on the best chew toys for pit bulls based on our own experience and verifiable Amazon reviews. We hope that we’ve set you well on your way to get a new toy for your pitbull terrier. How Long Can Your Tropical Fish Survive Without Food?